Wonderful is the creation, wonderful its continuity, Waheguru. How can I be able to explain with my limited knowledge, your fascinating infinite creation? The Word is the origin of creation. The first verb is the divine verb, it is the being, the existence. Man is an animal that can create awareness with the voice. Guru Nanak explains the Guru being in the Shabad. Gurmukhi is The Mouth of the Guru, The Word of the Guru; using the tongue they can formulate the sounds in such a way that by touching with the tongue different points on the palate, they achieve a psychological, emotional, physical and spiritual response. It has 108 sounds, each one is a powerful and transforming mantra. Mantras transmit a state of consciousness through sound, the more you repeat them you will experience the consciousness and the flow of energy that you achieve. 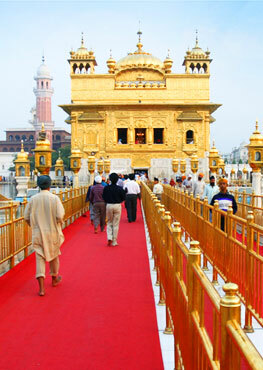 Shabad Guru is the way you can see how the Guru works in your physical body as an instrument. The Shabad Guru plays as an instrument the human body, its brain. It is the word that leads us from darkness to light. More important than the meaning of a mantra or a Shabad, is its innate power to transform the cells with the frequency of sound, it is a vocal Kriya that stimulates one of the 36 points on the palate, which in turn stimulates communication between the neurons and changes the chemistry of the blood. By changing consciousness, they unlock the limits of the ego over the higher self, limits that cling to the earth, thus freeing the true self to its elevation. Shabad Guru from its root structure: Shabad comes from Sha and bd. Sha means the expression of the ego, the attachments we identify with. Bd means to cut out off or to eradicate. The root meaning of Sha-bd is that which cuts the ego. It is not just any sound. It is not just a wise sound or a song of truth. If we break the word Guru into its inner naad, or atoms of sound, it becomes Gu-Ru. Gu means darkness or ignorance. Ru is light and knowledge. Gur is a formula or instruction. A Guru gives a Gur, a formula or technique that transforms darkness into light, ignorance into knowledge, the gross into the refined… Guru changes you. Guru develops the capacity to see. It removes darkness… The Shabad Guru transforms the practitioner by removing the barriers built by the needs of the ego. As the Shabad Guru vibrates, the internal dialogue in our mind ceases and we enter a state of Shunia, silence and deep inner stillness. Shabad is a true spiritual master who transforms us even beyond our personal capacity and expectations.